Wolf’s Rain – ULTIMATE EDITION. Coming 28th May 2018 - Limited to 1000 units. We love being able to bring something special with our releases, and none more so than when we’re able to pull out all the stops for an Ultimate Edition release. We know a lot of you have been wondering what to expect from us next when it come to an Ultimate Edition release. Today we’re delighted to bring you details on the next member of the Ultimate Edition family: Wolf’s Rain. From Studio Bones, the studio that brought you Fullmetal Alchemist and Fullmetal Alchemist Brotherhood, Sword of the Stranger, Blood Blockade Battlefront, and Eureka Seven. Synopsis: “Paradise-a legend, a myth, and a hopeless dream in a world that has become a wasteland. It is not meant for everyone, only the wolves thought to be extinct yet still roam the lands. When the Flower Maiden awakens, the path to the end will open. Kiba, a lone white wolf, wanders into a poverty stricken city on a quest. The scent of Lunar Flowers and the will to find Paradise is all he has. Along the way, he runs into other outcast wolves: Tsume, Hige, and Toboe, each with their own story and troubles. Fate bringing them together, and together they seek out the Flower Maiden, Cheza, and their way to Paradise. But, doing so is no simple matter. WHAT’S IN THE ULTIMATE EDITION? As we’ve developed the concept of out Ultimate Edition releases over the years, we’ve taken lots of feedback on board and combined that with our own thoughts to help mould them into what they are today! Our most recent Ultimate Edition release, Eureka Seven (at time of writing), was a great amalgamation of all that feedback and has helped shaped the future direction of what our Wolf’s Rain release will be ultimately (no pun intended) be and contain. Much like our Eureka Seven Ultimate Edition release, the entire contents of this will come packed in a bespoke mailing box so the contents can be packaged and stored safely. There will be a rigid case that will house a digipack containing four Blu-ray discs and 9 art cards. 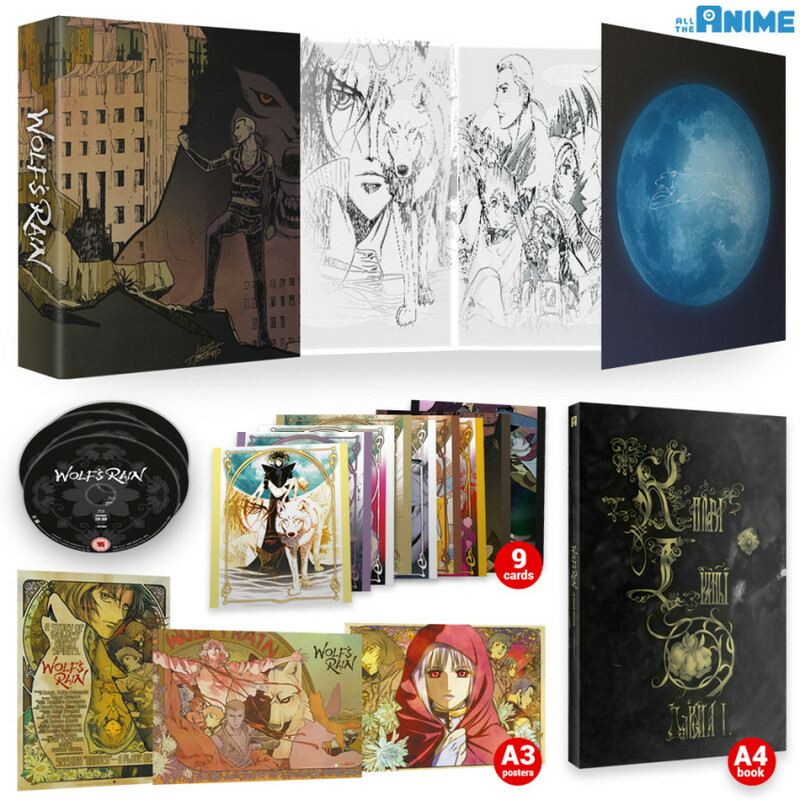 On the four Blu-ray discs themselves you’ll find the complete series of Wolf’s Rain – this being 26 episodes plus the 4 OVA episodes that conclude the story. All the episodes will have both English and Japanese (with English subtitles) audio options. Plus Japanese promotional material including the Pilot Film, two Promo Films and television promotional videos. There’s even the textless version of the opening song “stray” and two textless versions of the closing song “gravity”. And is if that wasn’t enough you’ll also get a 100 page art book that has been specially curated for our release! If you’ve been following our releases in general, let alone Ultimate Edition releases, you know we try to take advantage of every single piece of art we have at our disposal and this book is no exception! The book itself will be split into four sections total: Characters, Concept Artwork, Settings and The Art of Wolf’s Rain. WHERE CAN I BUY THE ULTIMATE EDITION? As we mentioned, there are 1000 units of this Ultimate Edition being produced. This release is not exclusive to any one retailer. But you can expect to be able to order it from the likes of Amazon, Zavvi, Base, HMV, Anime-On-Line and of course, our own AllTheAnime.com web shop. 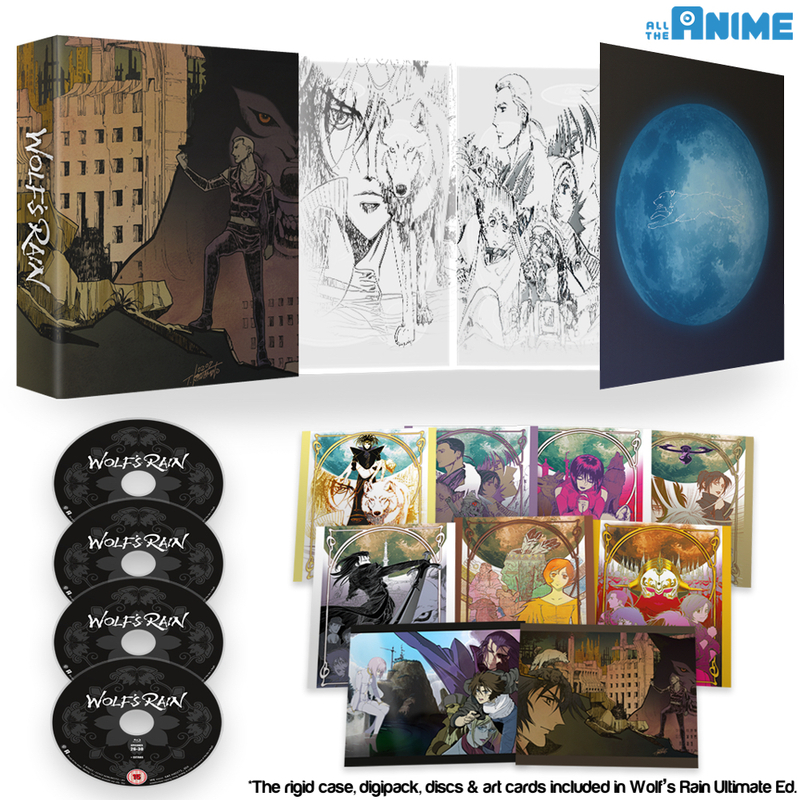 The suggested retail price for this will be £149.99, but as has been seen in the past with previous Ultimate Edition releases the price that will ultimately (no pun intended) be charged by retailers (including us at alltheanime.com) will be cheaper. –Is this exclusive to any one retailer? No, but it’s worth noting that there are only 1000 units total being produced. –Are you releasing a standard edition Blu-ray or DVD or the series? We will be releasing the series on standard edition Blu-ray, yes. As for a DVD release; it’s something we’re looking into but have no announcements to make at this time. Obviously if/when there is news we’ll make it known. –Are you still going to be releasing a Collector’s edition version Blu-ray, as was previously announced? We are not, no. This is because when we realised how much material was available for us to utilise and we because we want to make this release the best it can be, we decided to release an Ultimate Edition in place of a Collector’s Edition version. –What region code are the discs? All of our release are intended for UK & Ireland only, so the Blu-ray discs are coded for Region B. –What kind of audio is the English and Japanese language option in? English 5.1 & Japanese 2.0. –Given the age of the show, is the footage in widescreen? –Is this series in Native HD? Simply put, no. This series was created before television series being animated in HD was the norm. So the series has been upscaled (also known as an “HD Remaster”) to 1080p. For anyone interested we are utilising the disc master created by Funimation. 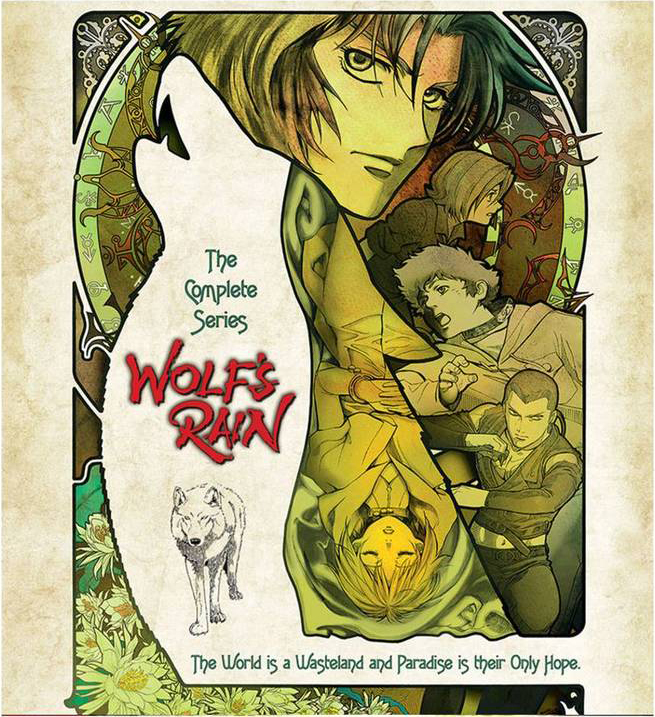 And that about wraps this preview of our Wolf’s Rain Ultimate Edition Blu-ray release! We hope you’re excited for it. Let us know what you think! Will you ship pre-orders before MCM or could MCM be the earliest possible time to obtain this? Will the standard edition Blu-ray include all 26 episodes and 4 OVAs?